First of all, let me say that I'm simply an avid collector of Mar-crest daisy and dot vintage 50's - 60's Oven Proof Stoneware (that's done a heck of a lot of research). The question, "Is all Mar-crest Hull?" has to be the most frequently asked, and is also the toughest. Thanks, Tanya, for being the one to motivate me to finally address this question. Hull Mar-crest pastels. Thanks, Shawn! For the past few years, I've spent hundreds of hours doing in-depth online Mar-crest searches. It seems that 95% of what I've read about Mar-crest has been copied and pasted from only 1 or 2 sites. If it hasn't been copy and pasted, the writer seemingly tries to put their own spin on what they've read from an online auction (that was copied and pasted from yet someone else) or from a quick Google search. Mar-crest pottery isn't the only collectible or subject this happens to. One problem is that there's such limited factual information about the history of Mar-crest stoneware. Add that to the fact that many online sellers like to sound authoritative about whatever it is they happen to be selling. Am I right? One thing I've learned is that anyone can write anything they want about any subject they want. (Seems everyone has a book nowadays, don't they?) Sadly, that doesn't necessarily mean that the contents are factual. Books, web sites, auctions, etc. Especially when the author is wanting to turn a profit. About everything I've read about Mar-crest I've taken with a grain of salt. I didn't work at the pottery nor do I have first hand information. Owning pieces, inspecting detailed pictures of Mar-crest items I don't own, comparing notes with fellow collectors, the look and feel of the items, what the original boxes tell us and much of what I've read in a few reputable pottery books (and 1-2 online sites) are what I believe to be factual. I've never seen the word Hull on a box containing Mar-crest, nor have I seen a Hull logo on Mar-crest. You'll either see a Mar-crest, Western Stoneware or Monmouth mark on a piece, unless it's not marked at all. And then there's that darn USA mark. Lord knows how many companies simply impressed USA on their pieces. It certainly has kept pottery collectors confused. The one thing consistent about the Hull / Mar-crest connection has been the word pastel. Does that mean that all Mar-crest pottery that's not exclusively warm Colorado brown is Hull? What if it only has a pastel interior? What if it has a pastel exterior and a white interior? How about the 5 piece blue snack set, or the 1 piece apricot and cream chip 'n dip? Or if the piece has an ivory or a caramel colored foam rim (all daisy and dot)? Must Hull / Mar-crest be daisy and dot? Or non-daisy dot? Could it be either? If you've examined the order form that came in original Mar-crest boxes, there's only so many different pieces listed. What about all the other pieces we know about? Where were all those left off of the order form bought? There seem to be more questions than answers. Check out closely the Misc. page, Pastels page and Collections pages on this site. I can see (and feel) a big difference in, for example, a pastel daisy dot large pitcher and a pastel ringed ball pitcher, teapot or plain cup. 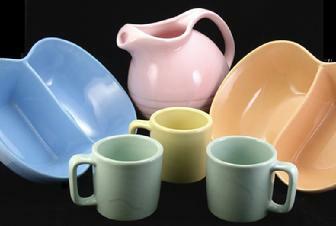 The plain solid pastel color coffee cups, teapots, ashtrays and tumblers have the look and feel of Hull, too, but the pastel daisy and dot pitchers at the top of the Pastels page (and seen picture below) do not. I reserve using the word Hull in most Mar-crest auctions. Personally, I don't like seeing the name Hull in a Mar-crest auction unless it's a known Hull piece, or it's used describing only a couple of other rare Mar-crest pieces (as the blue chip 'n dip). Why? It seems to me the seller may purposely be using a popular key word / collectible name they feel will help their auctions get more hits when buyers do a search. That, or they really do not know. 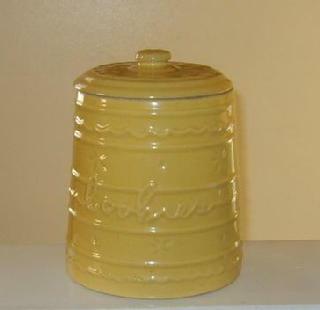 Style #1 cookie jar, in yellow.